Check Out Our New 10 Line Baseball Scratch Off Cards! 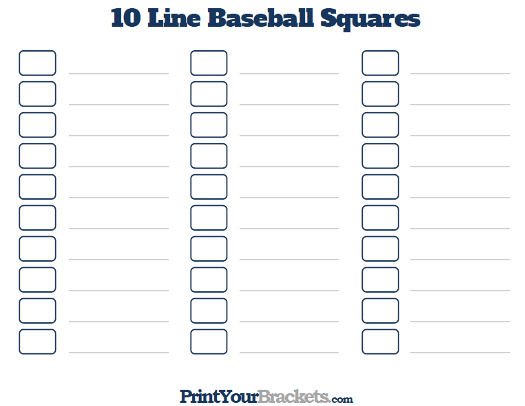 The 10 Line Baseball Pool works perfect for any baseball game. The print-out below allows you to run 3 different 10 Line Pools on the same sheet, it's also available as one game per sheet. Simply have the participants of the pool write their name on the line or lines of their choice. Once the 10 lines are full, randomly draw the numbers 0-9 and place them in the boxes beside each line. 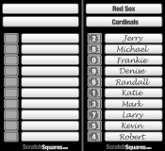 To determine the winner of the pool add the total runs scored by both teams and use the last digit of the total to determine the winning squares. If you prefer to have more than one winner per pool, you could have winners every inning, every other inning, or you can use the scores at the end of the 3rd, 6th, and 9th innings.